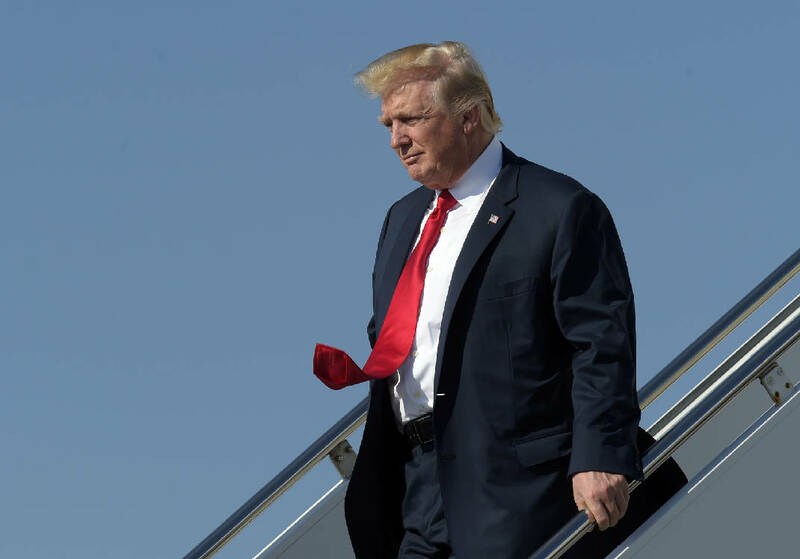 WEST PALM BEACH, Fla. (AP) - After four tumultuous weeks of governing, President Donald Trump is out of the White House doing what he loves best - campaigning. Trump will hold a campaign rally at an airport hangar in central Florida on Saturday afternoon. The event in Melbourne comes as he seeks to regain his footing following a series of crises that have threatened his young administration. For Trump, the rally offers an opportunity to recapture the energy of his upstart campaign and to connect with his supporters. Trump spokeswoman Sarah Huckabee Sanders said Trump wants to "speak directly to people across this county in an unfiltered way, in a way that doesn't have any bias." During an appearance Friday at a Boeing plant in South Carolina, Trump slipped back into his campaign's "America First" message with ease. "America is going to start winning again, winning like never ever before," he said, as the company showed off its new 787-10 Dreamliner aircraft. "We're not going to let our country be taken advantage of anymore in any way, shape or form." Big rowdy rallies were the hallmark of Trump's presidential campaign. He continued to do them, although with smaller crowds, throughout the early part of the transition, during what he called a "thank you" tour. The event Saturday is being put on by Trump's campaign, rather than the White House. Asked if it was a rally for the 2020 election, Sanders called it "a campaign rally for America." Trump himself promoted his appearance on Twitter: "Looking forward to the Florida rally tomorrow. Big crowd expected!" Since taking office, Trump has lurched from one problem to the next, including the botched rollout of his immigration order, struggles confirming his Cabinet picks and a near-constant stream of reports about strife within his administration. Trump's reset effort started Thursday with a marathon press conference where he defended his administration and denounced the "criminal" leaks that took down his top national security adviser. He used the platform to complain about the political press and to brag that his administration was a "fine-tuned machine." On Friday, even as Trump sought to get out of Washington and talk about job creation, he continued to rail against the media online. He tweeted that "The FAKE NEWS media (failing @nytimes, @NBCNews, @ABC, @CBS, @CNN) is not my enemy, it is the enemy of the American People!" Trump is set to spend the holiday weekend at what he calls his "Winter White House," his Mar-a-Lago resort. While there, he is also expected to continue deliberations on whom to appoint as his next national security adviser. On Monday, Trump demanded the resignation of national security adviser Michael Flynn following revelations that Flynn had misled Vice President Mike Pence about Flynn's contacts with Russia. Trump's first choice to replace Flynn - retired Vice Admiral Robert Harward - turned down the offer. The White House said Trump might interview national security candidates at his estate over the weekend. FBI Director James Comey left a meeting with senators on the intelligence committee Friday afternoon. Neither Comey nor the senators would discuss the subject of the meeting, but it followed reports that the FBI had interviewed Flynn about his contacts in late December with Russian officials. Trump tweeted Friday that "General Keith Kellogg, who I have known for a long time, is very much in play for NSA - as are three others." Kellogg, who is serving as the acting national security adviser, traveled to South Carolina with Trump aboard Air Force One. Associated Press writers Darlene Superville and Deb Riechmann in Washington contributed to this report.